If you have tried all kinds of nasal sprays, (antihistamine, decongestant or corticosteroid) and you still have chronic sinusitis, fungal sinusitis or a sinus infection, you are missing the critical ingredient. That is because there is a 93 percent chance your problem is a fungal allergy. 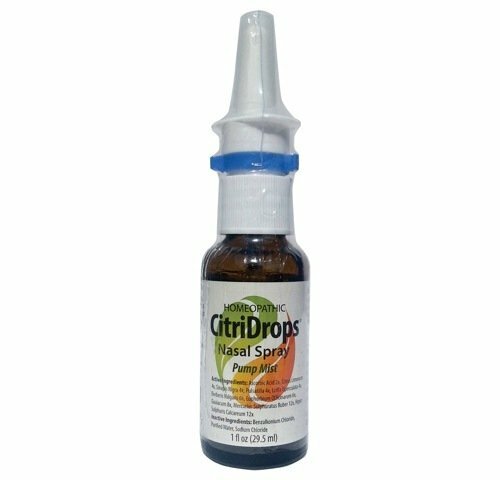 Citridrops Nasal Spray aids in their removal of mucous with mold and bacteria from the nose by lubricating and rinsing your nasal passages with all natural decongestions and saline. It is portable so you can take it with you to use whenever you are exposed to a moldy environment throughout the day. By using CitriDrops anti-fungal-antibacterial nasal spray you attack the source of your problem and allow your body to heal itself. This homeopathic product is a highly effective sinus infection remedy for people with chronic Sinusitis and mold allergies and is a key tool for breaking the sinus infection cycle. CitriDrops Nasal Spray is an all-natural, (no zinc) nasal spray that will soothe your sinuses and help you maintain clear passages. It is designed to remove the fungal mold from your nasal passages that is causing your sinus infections. Our product is safety sealed. To learn more about fungal allergies visit www.sinusitiswellness.com. If you have any questions about this product by Micro Balance Health Products, contact us by completing and submitting the form below. If you are looking for a specif part number, please include it with your message.